Looking for a quick way to spice up your quiz designs? Try adding a custom background image to your quiz. Background images help visually align your quiz to the rest of your course. Backgrounds can also set the context for your learning activity. To insert background images, you need to switch to slide view. Even if you’ve never used slide view before, it should seem familiar. That’s because the ribbon features look a lot like PowerPoint. Here’s a quick overview of switching to slide view and how to insert background images. For more inspiration on designing creative quizzes, check out this post in E-Learning Heroes. Backgrounds are the largest slide element and—more than any other object—set the context for your quiz content. The right background is all you need to transform a typical quiz into something more meaningful. Let’s look at two examples. 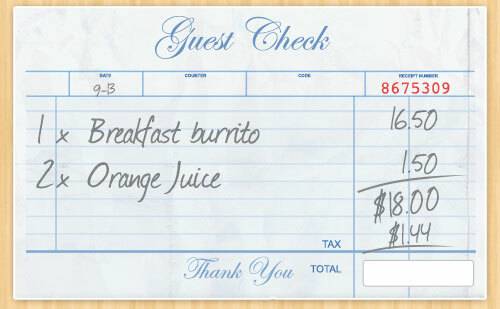 If you’re designing an activity to teach someone math, you might work with a visual commonly associated with math, such as a sales receipt. If you’re teaching economics or data analysis, you could design background images that resemble real-world charts. Quizmaker ’09 and PowerPoint use different slide sizes. Both outputs are the same, but the actual slide area available for content is different. If you’re like most e-learning designers, most of your content (graphics, images, illustrations) lives in PowerPoint. 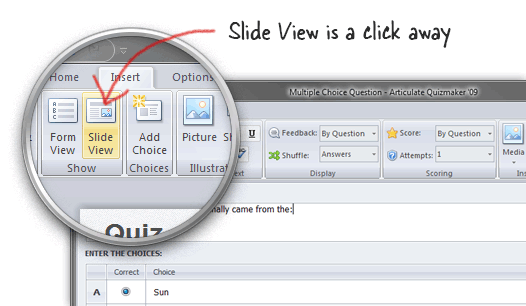 You can use PowerPoint to design your quiz backgrounds, but you’ll need to use a template sized for Quizmaker ’09. Your quiz backgrounds don’t have to dominate your slide to be effective. They can be subtle and take on a more supportive role. The thing to remember is that your background influences the context for your activity. Now it’s your turn to give it a go—boost your quiz with a special background design! And if you’re stuck for ideas, ask for inspiration in E-Learning Heroes. Love your idea of using backgrounds for quizzes to help maintain consistency in a lesson, create context, and make the quiz more meaningful. 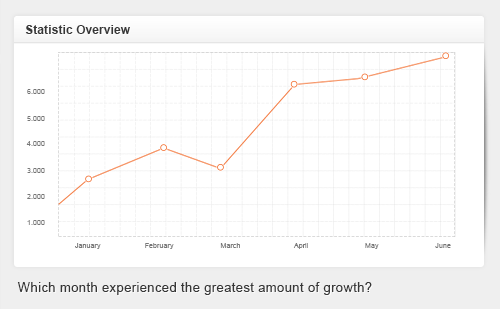 Of course this is just as true for Storyline as it is for Quizmaker, so I decided to use your Example 2: Data (Chart Quiz) and turn it into a Storyline quiz. Tx to you and Mike Taylor for the inspiration.